After getting to know Bat/Bad Blue, Ben “Fierce Eagle of Nevada” Smith and, last but certainly not least, Lick Joe, let’s meet the rest of Violence Fight‘s colorful personalities, shall we? Out of San Antonio, Texas, here’s Ron Max. 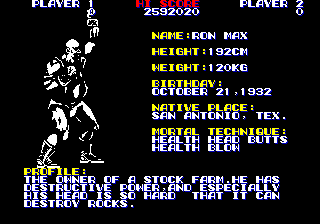 Boasting “destructive power” (unlike the constructive power shown by the other characters so far, of course), we are also told that “especially his head is so hard that it can destroy rocks”. I think he’s wasted as the owner of a stock farm, as he could instead have used his head (ouch!) to get ahead (groan!) in the world. 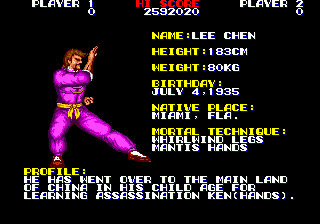 Note also the names of his two “mortal techniques”: health head butts and health blow. One wonders whose health he’s talking about. Does he gain health from head butting his opponents? 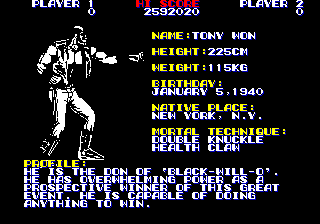 Or do his blows diminish his adversaries’ health (again, unlike the blows of every other fighter, of course)? Inquiring minds want to know.